I am 50 and my wife is 47. We’ve been married for 19 years and together for 23 years. We have two children. Their ages are 12 and 15 years old. We live in south-central Wisconsin. In our area, we would be considered urban, but in more densely populated areas (NYC for example), we would be sub-urban. Please allow for my definition of net worth. I consider net worth equivalent to our total investable assets (cash, money market, stocks, funds). I do not consider the value of our home, cars, valuable items, nor our kids’ college funds part of our net worth. We keep cars until they have no value and our house is our home, not an asset. I included estimated home value and college fund amounts for completeness. In investable assets, we hold index funds. We have about 3/4 of our investable assets in retirement accounts and 1/4 in non-retirements accounts. Readers may point out a couple of points with the splits above. 1. We have overlapping holdings within and among the different funds. Why do we hold over-lapping funds? With our different jobs, holdings before we were married, and holdings after we were married, each grouping had or has a different set of funds available. In addition, if holdings in our individual accounts are good enough and held long enough, then we either do not consolidate or we consider liquidating an account for major projects (for example, home remodeling – our kitchen is still awesome over seven years after the re-design.). 2. Why is our bond percentage so low? Agreed, our bond percentage is low, but it is better than a few years ago (~2%). For bonds, we choose to increase the holdings with new investments over time rather than re-balancing to a percent holding. Currently, all the money in one of our 401ks is going into a bond index fund. The bond holding in the other 401k is a poor choice (high fees and so-so historical performance). Over time, our bond percentage will increase. In our current macro-financial environment, we think our slower, dollar-cost averaging method to re-balance our bond holdings is preferable. We have neither mortgage debt nor credit card debt. We use credit cards and pay the balance monthly. I am a biomedical researcher, low management level. My wife is in a similar field. My base salary is $104,000 year. My wife’s base salary is $140,000. My first job was at $60,000; my second job base salary was $48,000 but I negotiated additional stock options. After the second job, I changed jobs every 3-6 years, increasing base salary to my current ($104,000). I think my answer to this question is unique. My job moves were not for a better title and were not focused on more income. My job progression was more of an adventure to keep myself engaged. I get bored easily. I enjoy talking about problems; I enjoy solving problems. Once the implementation of solution(s) is complete, sometimes political fall-out occurs; sometimes, the project for the next problem requires too much travel or is inadequately resourced; sometimes, I want something different; sometimes, the situation is good enough. For me, I find repetitive processes – even product development – challenging. In the job world, performing or running through the same set of processes at the same company does not engage me. 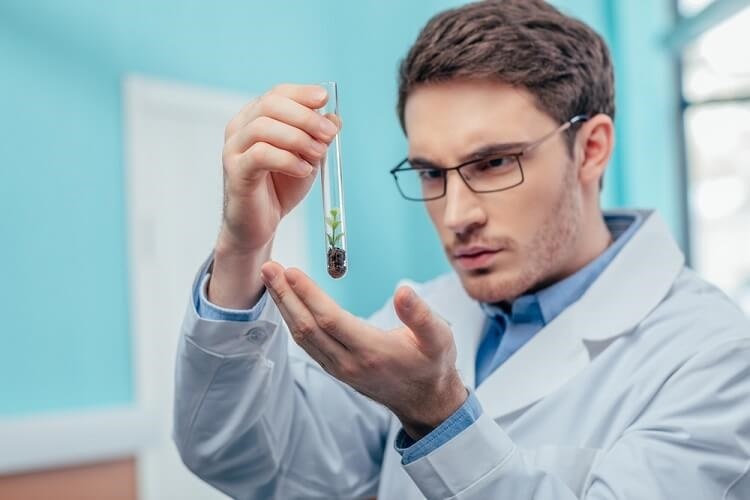 I enjoy working with people developing and validating a test or two; coordinating activities at different sites with different groups and transferring the reagents to operations. In addition, preparing document submissions to regulatory agencies is (weirdly) fascinating to me. However, these are interesting and fun for a while. Once I’ve done this successfully a few times, that is enough for me. Now, my work focuses more on troubleshooting manufacturing problems and product improvement with less emphasis on new product development. All in all, I think two of the most important assets for job hunting and growth are (1) the ability to notice / see someone else’s problem as an opportunity, and (2) have minimal concern for whether you are qualified. In many of the problems I solved, I did not have the “official” qualifications or training for the role or even the background knowledge of the science behind the problem. However, the problem seemed interesting. As expected, these are questions that are usually the root cause of the political fall-out. This is my fault and my responsibility, but this also makes me who I am. My focus is the problem solving, and I am not concerned with the potential political fall-out. Implementing the solutions and creating (sometimes) immediate savings in time and money saves jobs, helps the company, and can makes others’ work lives easier. Someone else’s pride does not help the bottom line, nor does hurting someone’s pride concern me. My work life balance is excellent, and it always has been excellent. One reason for this is my work philosophy. I work to have a life; I do not live to work. My wife and I do our best to share responsibilities with our kids and home. For example, when our kids were young, I changed them and comforted them in the middle of the night, so my wife could rest. If/when they were hungry, I helped with feeding(s). After feedings, I did what was necessary, so my wife could rest and my kids were comfortable. As our kids get older, we share responsibilities for when they are sick, doctor’s appointments, etc. I make lots of mistakes; we both make mistakes. However, we learn from the mistakes and keep trying to be better. Please see below in “What advice do you have for ESI Money readers on how to become wealthy?” for some additional information. Other than our base salaries, our investments generate income (re-invested dividends). In addition, we receive 401k matches, profit sharing, and stock units. Our house-hold annual spending is just over $75,000. The table contains the main categories and approximate costs per year. We do not follow a written budget. We review expenditures ever 3-6 months. We discuss large dollar purchases with each other. We save between 22% and 30% of our gross income per year. Overall, this range has been consistent over time. When our children were younger, day-care costs were high, but overall expenses were roughly the same. 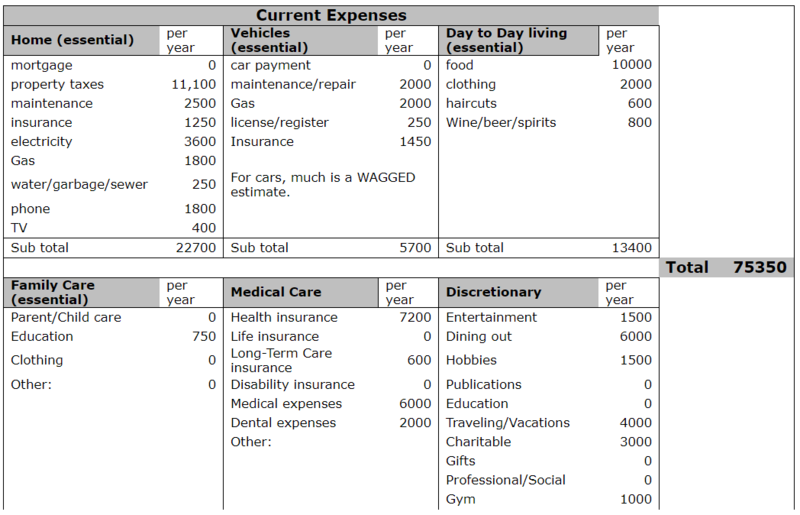 The source of the expenses changed – day-care costs instead of entertainment / dining out / hobbies / travel. We both love coffee and love to travel. We are lucky in that our travel profiles are complementary and similar. Neither of use enjoys resorts nor eating out every day. We find Airbnb/VRBOs, buy food, and use the rental as our base to explore. We keep travel costs down by “living” wherever and whenever we travel (doing laundry, cooking our own meals, bringing lunch). As for coffee, we buy coffee from a local roaster and have multiple pieces of brewing equipment. We rarely buy coffee out, and my friends have told me that they would pay for my coffee. Our overall philosophy combines minimizing costs and minimizing the amount of time to monitor our investments. We had little to no under-graduate college debt going into graduate school. The main reason for this is college tuition was much more affordable in the 1980’s than now. High costs and potential high family debt were not required for in-state public universities. I remember getting into some private universities that would have been 4-5-fold more expensive per year than the in-state public university. As an 18-year-old, I could not mentally justify the 400%-500% increase in costs for a college education at a private university. As a result, I earned my undergraduate degree at the public university. In this area, we were luckily with our undergraduate education. Today, affording college is more difficult. College costs have risen so much more quickly than inflation and salaries combined. This is one of the reasons we will help-out our kids with college costs. Bad debt occurred and accumulated in graduate school; some months’ pay simply did not meet all needs (housing, food, heat, health-care, etc). Credit cards provided the bridge too many times. However, we focused on these eliminating debts as quickly as possible – understanding even a few extra dollars per month will eliminate them faster. I think the idea of a best investment is more of a combination of two investment ideas. One is not panic selling; we did not sell during any major market downturn. In addition, we invested more during these same major market declines. Either alone is beneficial, but the combination is synergistic. So far, this discussion contains our thoughts on index / passive investing. However, I have day-traded as well. During the biotech hey-days of the mid-1990’s and again in the mid-2000s, I combined my knowledge of approval decision dates for a drug, clinical trial data announcements (phase 1, 2, and 3), with my scientific and job knowledge, to make some interesting investments. On one investment, I accidentally set my stop-loss incorrectly. Needless to say, I lost >95% of that investment before it sold, and the company went out of business. However, this type of investing takes too much time and is too stressful. In addition, my day-trading ROI is quite positive and at a not disrespectable multiple (even for VCs). The other big mistake was not investing sooner. We cannot correct this, but we can help our kids understand this idea better. We opened UTMAs for our kids, and they are investing a few dollars per month. Hopefully, this will help them understand compound growth and starting early. My older child is beginning to understand; my younger does not understand this too well right now. In both cases, time is their ally for growth and understanding. For our investments, our overall average is just under 10% – as provided by the investment company. When calculating our increase in net worth over time, our average is just under 12%. I prefer this measure. Changes in net worth over time provides a truer picture of wealth accumulation. For example, around 2011/2012, the market had decent positive returns. However, we were in the middle of a major home remodel. As a result, our net worth (investable assets) was essentially flat – zero, even with the positive market returns. Yes, the re-model increased the value of our house, but as indicated above, I do not consider the house as part of or net worth. It is our home, and we still love this remodel after all these years. We re-balance once a year, usually Q1. Sometimes, I’ll look at our investments during late Q2. However, no changes occur at this extra-check-in. Re-balancing and/or re-adjustments occur once per year. Our salaries are high, and we have managed debt decently. We live in a lower cost area that has great public schools and reasonably priced homes. We invest in low cost index funds. We save / invest any bonuses (company stock sales, year-end bonus, profit sharing). We never spent our year end pay-outs. We do not hold any stock in the companies where we work(ed). We sell options and RSUs as soon vested, no matter where the stock price might be. We do not buy company stock via a stock purchase plan. We understand missing out on the tax advantage of holding the stock for greater than one year; we understand the financial benefit of the employee stock purchase plans. However, I’ll remind everyone about the Enron’s, WorldCom’s, and many other companies’ stories throughout history. Overall, our best strength is Save part of the model. Yes, we have high salaries, and we invest. Our goal was not becoming a millionaire. Spending less than we earn and saving has been the plan. Being engaged and fulfilled with life has been and is still our focus. However, child-care costs (day care) impacted saving quite a bit. With our two children in day-care, we were spending more than the cost of a college education (undergraduate degree at a public university) for day care. Care costs have increased quickly since our children were in care, making it that much more challenging for families today. For families starting out, saving is more challenging today due to the higher expenses of child-care, health-care, elder-care, and (in the future) college tuition (at a minimum). We follow our investment plan. As we get closer to retirement age, we’ll mitigate risks but not increasing investments during down-turns. In addition, we are increasing bond holdings slowly, with the ultimate final goal of 30%-ish. Other than yearly re-balancing / re-directing allocations every year, we’ll refine our long-term plans / strategies every couple to few years as we get closer to not working at our current jobs. Right now, we are in the accumulation phase. These indicate we have a >80%-90% probability of being OK in retirement, even with modeling faster draw-downs / more extravagant lives (for us) / un-expected (expected in this case?) expenditures. (Remember, once you have your investment / retirements / draw-down model, playing with the model is merely another column or row in the spreadsheet. Here, I must caution about analysis paralysis; too much “what-if” scenario modeling can get stressful be become so unrealistic)). I think I’ll answer an obvious question. Why are we still working? We both enjoy our jobs enough – we don’t love them, but we don’t hate them. For me, mine is entertaining enough right now. I agree, this is not the greatest reason to keep working. However, one big reason exists to keep in our current jobs for now. One big wild-card is health-care. I have chronic diseases, one expensive and one with more reasonable costs. In the current political climate, affordable care act (ACA) plans are too expensive and would not provide enough coverage. In addition, all the proposals for “reforming” healthcare worry me. Why would I trust any of current proposals on the state or federal level? The current system is not perfect and could use some tweaks, but other proposals worry me. Let me remind others of health-care coverage before the ACA. In the Pre-ACA era, insurance companies delayed or even denied covered for pre-existing conditions – even through employer-based plans. In addition, individual coverage for people with pre-existing conditions was NOT available or was so expensive that the coverage would cost more than paying cash. Jobs at better employers usually had pre-existing coverage, but a small employers or smaller college systems coverage was a wild-card. I choose jobs (and in my case, graduate school) based solely on the health care coverage. In addition, lifetime coverage maximums were a reality pre-ACA, and the ACA eliminates lifetime coverage maximums. Historically, once a lifetime maximum once reached, no coverage from any other company was available. These lifetime maximums were NEVER indexed to inflation nor indexed to health care cost increases. For example, lifetime maximum coverage was around $1 million in the early 1990s and about the same in the middle 2000s, over 10 years later. In the Pre-ACA days, I estimated how close I would come to the lifetime maximums before I’d be eligible for Medicare. During the 1990’s these estimates were not too bad. I likely would not have reached the maximum before Medicare eligibility. In the 2000s, the estimates were depressing because the caps were not higher, but costs were much higher. I likely could have reached the maximums before Medicare eligibility. As a result of health-care coverage, we will keep working – solely to generate a bigger cash-cushion. Overall, we have no major behavioral shifts since them. We did not start monitoring investments closely until 2009 / 2010. The easy and obvious answer is I wish I started saving (and investing) earlier. Another mistake I made was not investing more money during the major down-turns, specifically, the summer 1998 correction, and the 2000-2002 and 2007-2008 downturns. We did invest more, but using perfect hind-sight, more would have been better. The critical foundation is saving. Yes, investing and earning are important; these are more of an output or result of saving. After all, if no savings occur or do not exist, then investing cannot occur and (future) earnings are more difficult. To expand on this and take a slightly different path now, I believe “wealth” is more than money; time / free will contributes to “wealth,” and living a life and feeling fulfilled are (arguably) important than cash. For example, all my jobs have been and are stressful and time consuming. However, in all cases, I was always present in our lives; I allotted or gave time for things that mattered to our family. From a job perspective, I completed my responsibilities and kept projects moving forward, but I did not volunteer for additional responsibilities. I wanted the time for my family, not the job. Specifically along these lines, after our second child was born, some issues came up, and my wife needed me. I left meetings / took the time to help her and be with her – no matter what was happening at work. Yes, my bosses questioned my commitment and being a “team” player. Yes, they threatened to fire me or place me on a PIP. Each time, I invited the opportunity, but they never followed through. These were all empty threats. The work was completed and no delays occurred. This is how I learned early what the “real” work world was like. In these cases, I delivered whatever my boss / the project needed. I fulfilled my promises, but I did it on my time and terms. I did not volunteer for the “extras” – knowing that I would not advance up the org chart. However, I worked with people that did volunteer extra time, lost vacation time, got sick, and at one job, actually died from a heart attack. Mostly, these people also did not advance up the org chart, and in one case, an entire family’s life was destroyed. Interesting. I have never had second thought or regretted how I did things. I am proud of my work accomplishments, but these accomplishments do not define me. What defines me and what are my clearest (and dearest) memories? Seeing my kid’s face light up when they saw me at a performance or seeing the relief in my wife’s face whenever she needs or needed help. Even now, I still go to most of events for our kids. My kids do not overtly hug me (as previously) or do not acknowledge me (they are teen-ager / near teen-ager after all), but I do see their faces. The expressions show appreciation. These are the things that really matter to me. Our memories are what matter to me. When I die, I may be the person who thinks maybe I should have spent more time at the office, but I doubt it. Currently, there are no planned changes. However, I am thinking about something new / different. I included some details in the question immediately below. One big benefit of our net worth is knowing that even if we both lost our jobs, we have the luxury of sufficient funds for a prolonged period without work. I am personally ready for a big change. No classic retirement, but something very different from what I do now. Some options include: selling our travel photos; becoming a teacher; starting a consulting business; running some type of informational web-site / blog; becoming a personal trainer. The biggest issue is health-care. Once I turn 65, coverage will improve with Medicare eligibility, but I have concerns about healthcare for the next 15 years, especially the next five to six years or so. My training as a scientist and work as a product developer contributed. Scientific thinking requires evaluation of data and a determination of the next steps with the information; it requires as much objective thought as possible. Product development requires budgeting, resource allocation, strategic and tactical planning, cash flow estimations, evaluations of what-if scenarios and more. Also, scientists enjoy learning in general. If I do not understand something, I research and learn about the topic. Finances and money are items to think about, to plan and to manage – things I have done throughout my life. As I mentioned about, if something “clicks,” I think it becomes repetitive, and I do not like repetitive processes. Overall, every time I read something financial, I learn something new or think about something differently. In addition, we are continuing our kids’ journey through money and finances as well. Understanding how teen-agers think (and think about finances) is quite the experience. A few of my heroes are my paternal grandmother, my wife, my kids, and the student who stood in front of the tanks during the Tiananmen Square protests (Summer of 1989). I do remember feeling sorry for him. At the time, I knew enough about the world to understand that person likely did not survive that day. However, he had the courage to stand in front of tanks and sacrifice himself, hoping to make his country better for others. That picture shows true courage, take a look at that picture and try to imagine what that student was thinking. There are many other pictures and situations in history, but this one sticks with me. Above all, each of these people taught me how they (might) understand or (might) view something; how they are thinking about an issue; how sometimes a movement is worth whatever the personal cost. Change happens slowly but change always needs a start. As for inspiration to excel, no one person inspired me. I am in this world to live a life and hopefully leave the world a better place. I hope I leave each situation better for the person I am with at the time. I hope others receive more from me than benefits I receive. I hope to guide my children to help others and live a full life independently as well. Yes, we give. We give to charities that are consistent with our life goals, but I do not know the exact percentage. In addition, we donate time to our kids’ schools (a few hours a month). Finally, I donate blood a few times per year. We have an estate plan and related documents (powers of attorney). In addition, we have provisions in the event we die before our kids complete college. In this case, the plan provides funding for college. Then, distributions would start a few years after college graduation and proceed over a few years. The delay in starting distributions is to allow our kids to establish themselves financially before distributions start. Hopefully, this will not be needed. What are some benefits of keeping money in a previous employer’s 401k vs a roll-over IRA after leaving a job? The focus is what are the (subtle) differences regarding how IRAs vs 401ks are treated with regard to estate planning, student aide, and bankruptcy issues. What are some opinions on citizenship planning, especially for a country like Malta or Canada? For Malta, the money goes into Maltese government bonds (with the investor receiving the proceeds I believe). In our situation, one of the largest benefits would be the accessibility of the EU health-care system. Currently, my 401k is a 50/50 mix of Roth 401k and traditional 401k. In the future, what kinds of problems will this present for roll-overs and/or taking distributions? I have this feeling the mixing the Roth / traditional 401k will present problems in the future. Thanks for the info MI 115. Interesting to hear the movement in your career and how healthcare has impacted your decision on which job to take. I agree it’s tough to stay motivated after 3-5 years of doing the same thing. Re: rollover IRA from previous job – I would encourage you to look at your current IRA company fee structure, where you would roll the money to. Some companies will offer a breakpoint (discount for fees, transaction costs). Companies all do this differently but there could be a benefit to reaching a cumulative $500,000 and another breakpoint somewhere between $1 – 3 million which could save several tenths of a percent which we all know add up over years. Really enjoyed reading your post – great way of viewing work/life balance. We are in a similar place and can relate. (And have the same concerns over pre/post-tax 401k funding). Thanks for sharing your thoughts and ideas. Thanks for the reply IzzyJ. The pre/post tax 401k may add a wrinkle or two, but at least, we can learn something new. Thanks for the great info MI115. Interesting to hear what the changes to healthcare can do to a person – I think a lot of people hear about the changes but they don’t affect them so they don’t put much thought into it. Maybe the best thing to do for now is support politicians that are for a single payer healthcare system (it seems to be catching on a little more these days). Agreed. We have supported programs and people for expanded healthcare access. The USA appears to be inching closer to a more universal care system. It will be interesting how this will proceed. This is what I’m juggling right now and it’s so so challenging… would appreciate advice here! Understood Monika, this is challenging. These items are very different in European countries, especially healthcare costs and college education. Advice is challenging in this area; there are no magic formulas nor investments. What works for one family may not work as well or at all for another family. I believe one very important point is to start, no matter how small. A few dollars saved per month builds to hundred(s) of dollars saved per year. Some investment companies have lower investment minimums and some investment companies may waive a minimum investment if an auto-investment is set up. In our case, we opened UTMAs for our kids and they invest $5.00 per month from their savings accounts. I’ve seen a lot of this too with mid-career professionals, including myself. To earn significantly more after hitting this point requires “likability”, luck and other factors beyond just competence and hard work. So IMO, get to that mid-level salary level as fast as possible to let the savings and compound interest accumulate as early as possible. That way, if extra earnings don’t come your way, a multi-million dollar net worth goal is still in easy reach. Separately, can you elaborate on your thoughts on the savings amount in your kid’s college fund … What are you targeting for your kids once they go to college and why is your target what it is? For the college savings, we are targeting the total for a four year public in-state tuition, room and board. I took the 2016 cost (tuition, room and board), estimated the overall increase for the previous 10 years, added an additional weighting factor. Using this formula, I projected out over each child’s college career (4 years). This will be the amount provided by us. I’ll prepare a “contract” delineating expectations and requirements for the college years. Relatable article for me. Fellow biomedical systems engineer here, also worked in healthcare in WI before moving out. Agree that after a product development lifecycle is complete, you would like to do something different. Good that you are keeping up the work/life balance. Time is one thing that can’t be brought back. So you got your priorities right. Thank you Sam. I wish time were bankable and had growth opportunities. I have a lot of similar concerns and am in a similar boat. The what if on healthcare concerns is what keeps me wanting to work longer. I do not foresee a traditional retirement for me for that reason alone. I hope to “downshift” to a lower stress or part time job when I get to my savings number. I want to have the flexibility of still earning, and hopefully having access to employer supported healthcare as long as possible. No matter what, saving as much as possible gives you the most options regardless of what life throws in front of you. That, as much as anything, is the most important thing. Agreed and understood. I’ve been through layoffs, but these were worry free because we had sufficient savings. At the time(s), others were so stressed about loosing their jobs. Just wanted to chime in and say that this interview definitely resonated with me. Like the interviewee here, I have built an entire career out of identifying and solving problems that others didn’t think were fixable, or simply thought it was too much work to fix them. It’s simply amazing how much of that there is out there, especially in the larger companies in which I’ve worked. And it pays well, too – I am currently making far more than the average in my field, largely from being able to solve problems like this. You are correct Jim. The naysayers are a tough bunch, and sometimes they have useful pieces of information. On the thinking point, after implementation, a corrective action / change becomes the “result” of the “challenge, action, result” for a resume. Even if naysayers catchup and close one door, your work has opened new doors and quantifiable points for your resume / next gig. Family first. There’s a good man behind that keyboard. Your net worth could be 5 times what it is now, but if your family suffers for it, it’s not worth it. If only the comment system would let me give a thumbs up emoji! Thank you JC. The 5-fold “could be” is flattering. Even so, I would not trade my choices and path for any others. I am 53 and have been working as a senior manager in Corporate America overseeing field operations in my industry for the last 20+ years. Weekly travel, tough deadlines, a never ending grind for better margin, unions, tough labor climates, and yes plenty of naysayers and Monday morning QB’s who launch advice from the comfort of the corporate office with no clue about conditions in the field. I am not quite where I want be savings wise, however own about a 1M in real estate free and clear, and am completely debt free, kids are grown and successful and about two months ago I really started to feel more stressed at work than usual. My wife asked why I work at this level, as I simply do not have to, she said that our expenses are so low we could both work at Lowe’s and be fine, and suddenly that really resonated with me. I instantly felt relieved, and decided then and there that I am done with this. I networked with friends in the industry and within a week landed at a small private company in the same field, however 7 direct reports vs 33, and monthly travel vs weekly. I was prepared to take a big hit, however ended up making almost the same. I have zero regrets about the decision and hope to ride this out for a few years, but if it does not work out, I am prepared to take her up on her Lowe’s idea. To your point, it is not always about the money. Agreed EO, it not always about the money or moving up the corporate ladder. Congratulations on finding a new path and enjoy the future. – Run a disciplined “business of you”. Each year this couple made a profit and invested wisely and is now financially independent. Thank you Mr. Shirts. One of my favorite parts of your story is your desire to not be a absentee parent. Parenting is challenging – actually it just really hard – but it is also fun and interesting. Seeing the world through another’s eyes and trying to understand (and explain) what’s happening is just so rewarding. Best wishes to you, your wife, and your future.